The co-operation is branded under the name ‘Southern North Sea Energy Alliance SNSEA’. The MoU is said to provide a framework to pursue closer working relations on promoting the Southern North Sea regions as an offshore and marine energy hub and to foster joint projects between the parties and their members and stakeholders. 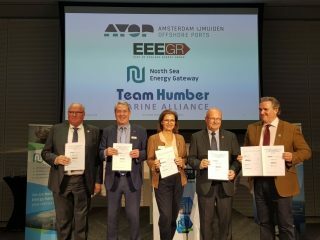 “The Southern North Sea is hugely significant in terms of existing and planned offshore wind farms, but we are also saying it could become the innovative ‘energy garden’ or ‘living field lab’ of Western Europe due to a high concentration of oil and gas assets which will be decommissioned or abandoned over the next decade along with the great potential for carbon capture and storage, wave & tidal, energy transmission & storage and other emerging technologies,” Mark O’Reilly, Team Humber Marine Alliance chief executive, said. Posted on October 23, 2018 with tags Southern North Sea Energy Alliance SNSEA.